This is it! 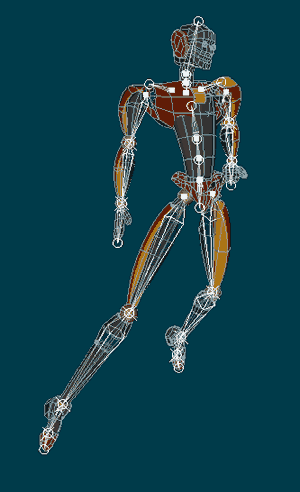 The final section of “Animation Master Character Rigging Basics (Part 1)“! All that is left to do now are the arms so let’s finish this up now. Here are the CP assignments now. Only the arms remain. Now let’s do the arms. We will use the same approach that we used with the leg; we’ll set up one arm and then we will let the MirrorBone plug-in do the other arm for us. We’ll zoom in on the arm for better selection accuracy. With this part of the model you may feel comfortable enough to not hide or lock any of the geometry. If you do, go for it. Check the font to make sure that the bones are lined up properly. We are going to create a branch of four bones. 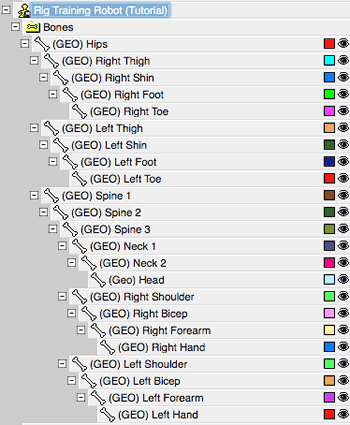 The parent for this branch will be “(GEO) Spine 3”. The next bone will be the bone for the upper arm. Next comes the forearm bone. Finally we’ll make a hand bone. There are no fingers on the robot’s hands so we do not need to set up finger bones. As you can see in the image on the left the shoulder bone is not attached to its child bone. Don’t forget to check the top for alignment too. We are going to attach the hand bone to the forearm and then the forearm to the upper arm. Don’t attach the bone for the upper arm to the shoulder. 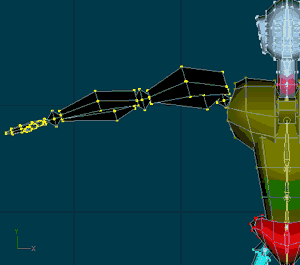 Remember this will make those bones an IK chain so let’s select the “Lock IK” option for the attached arm bones too. I have chosen to point all of the arm branch’s roll handles back towards the rear of the model. You may do this as well or you may choose to point them forward, in the same direction as the leg. The choice is yours, just make sure that each bone’s roll handle is pointed the same way throughout its chain. I’ve renamed the bones here from the right shoulder down to the hand. Let’s rename these bones now if you have not done so yet and double check the hierarchy. 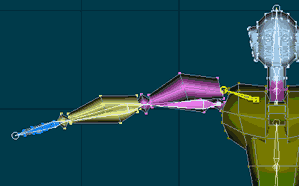 The completed geometry rig in the PWS. 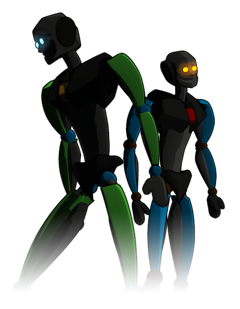 Now that the robot’s right arm is done and the bones are the way they should be we are going use the MirrorBone plug-in to rig the other arm for us. 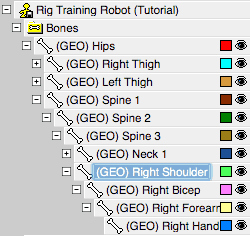 For this step you should choose “(GEO) Right Shoulder” as the bone to mirror. Once you do that you should be done! All you need to do now is to check your “Bones” folder in the PWS to make sure that MirrorBone did its job correctly then check your model in an Action window. Just a pose with the finished geometry rig. We can pose him now but we’ll set-up a better method of control for him later on in this series. We are finished with the geometry bone set-up! Experiment more in an Action window with this model. 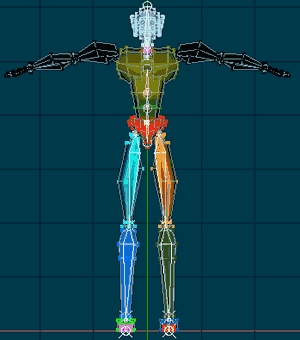 In the Character Rigging Part 2, we’ll learn about what constraints are and how we can use them to make our rigs better.